Credit days improve from 55 to 52 days for businesses. Businesses in Dublin wait longest at 54 days to be paid. 61% of businesses are experiencing delays of 2 months or more. 69% of SMEs would favour a statutory 30 day payment regime. 33% of big businesses are taking longer to pay. ISME, The Irish SME Association today (May 22nd) published the results of its quarterly Credit Watch Survey Q1’18. Based on the findings, Credit days for this quarter have improved from 55 to 52 days. Businesses in Dublin are waiting longest to be at 54 days. 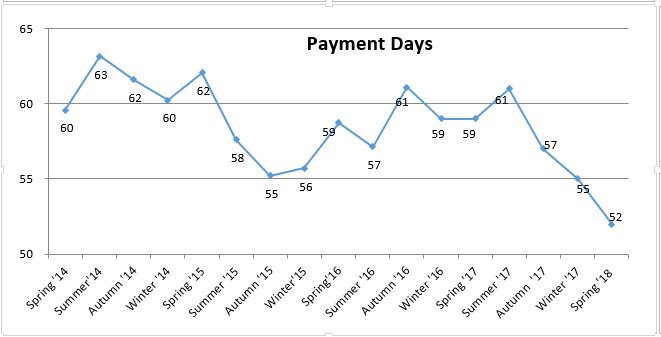 While the Wholesale and Construction sectors are waiting the longest on payment; an average of 60 days. The Association welcomes this continued decrease in payment days and highlights the continued need for cash flow improvements. Average payment period for SMEs in Q1’18 improves from 55 to 52 days. 61% of SMEs are experiencing delays of 2 months or more, down from 67% in Q4’17. 11% are afraid to charge for late payments in case they lose custom. 33% of multinationals are taking longer to make their payments, up from 17% in Q4’ 17. 69% of SMEs favour a statutory 30 day payments regime; with no opt out. The Wholesale and Construction sector are waiting longest on payment at 60 days, while Retail is waiting 51 days. Businesses in Munster are waiting longest on payment at 55 days. Businesses in Connaught and Ulster are waiting the shortest time at 45 days. Leinster and Dublin Business are waiting 51 and 54 days respectively. Actively publicise, promote, and champion the Fair Payment Code for all businesses. Insist on adherence to Fair Payment Charter as criterion for granting state contracts. Insist that all state agencies adhere to the 15 day rule. The office of Government Procurement should require all tenderers to publicise their creditor days. Businesses on average are waiting 52 days to be paid, this a three day improvement on the previous quarter (Q4’17). Businesses in Construction and Wholesale are waiting longest to be paid at 60 days. Dublin businesses are waiting on average 54 days. Businesses in Leinster are waiting 51 days. While Ulster and Connaught businesses are waiting 45 days. Business in Wholesale and Construction are waiting on average 60 days, the Hospitality sector is waiting on average 59 days, while Manufacturing and Services are waiting 58 days. Businesses in Retail are waiting the shortest on payment at 51 days. Our members reported that the Credit period compared to 12 months ago was longer, shorter or the same. 73% stated it was the ‘same’, 17% reported it was ‘longer’, while 9% stated it was ‘shorter’. We asked our members which category of customer was taking the longest to pay. ‘Other SMEs’ were reported as taking longest to pay at 64%, down from 75% on Q1’17. 33% of Big Businesses are taking longest to pay, up from 17% in Q4’17. Government Departments and State Agencies are at 8%.